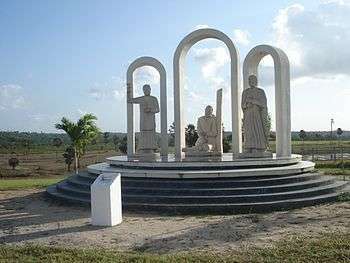 The Blessed Martyrs of Natal were a group of 30 Brazilian Roman Catholic individuals - two of them priests - killed in southern Brazil in massacres that a large group of Dutch Calvinists led. One priest was a Brazilian member from the Jesuits and an evangelizer while the other priest was an evangelizer himself. The others were all members of the faithful which included unnamed individuals and some of them being children. The 30 individuals were beatified in Saint Peter's Square on 5 March 2000. The Natal region was colonized after the Portuguese Roman Catholics arrived but the Dutch Calvinists soon took over and spread their anti-Catholic sentiment across the region while making persecution of all remaining Catholics an objective for them. Despite the air of persecution there were those priests that moved to the area in order to evangelize to the people there. André de Soveral was born in Brazil in 1572. He was a professed member from the Jesuits and entered the order in 1593 before starting his period of novitiate in Bahia. He studied Latin - as well as the native language - and theological studies before being sent to the Olinda college. His first experience in the missions was in Rio Grande do Norte in 1606 amongst the natives for catechism lessons. In 1614 he was a parish priest in Cunhaú. On 16 July 1645 - a Sunday - there were 69 people that gathered in the chapel of Our Lady of the Candles for a Mass that Soveral presided over. It was just before the Eucharistic rite that Dutch soldiers attacked the chapel and murdered Soveral and a companion - Domingos Carvalho - and others. On 3 October 1645 a total of 200 armed natives with their Dutch allies targeted and hacked to death 30 individuals including children and one priest. The leader of this group was the radical Calvinist Antonio Paraopaba. Mateus Moreira - a victim of the onslaught - cried out as he died: "Praise be the Blessed Sacrament". Monument dedicated to the slain martyrs. The beatification process opened in Natal on 6 June 1989 after the Congregation for the Causes of Saints issued the official "nihil obstat" and titled them all as Servants of God. The diocesan process spanned from 1989 until 1994 and the C.C.S. later validated this process on 25 November 1994 before receiving the Positio in 1998. The theologians approved the cause on 23 June 1998 as did the C.C.S. on 10 November 1998. Pope John Paul II confirmed that the group were all killed "in odium fidei" (in hated of the faith) and thus approved their beatifications. He presided over the beatification celebration in Saint Peter's Square on 5 March 2000. It has been reported that the group could be canonized as saints sometime in 2017; Pope Francis has expressed his closeness to this particular cause and willingness to canonize them as saints. The current postulator for this cause is Fra Giovangiuseppe Califano. 1 2 3 4 "Martyrs of Brazil". Saints SQPN. 16 July 2016. Retrieved 2 November 2016. 1 2 "Blessed André de Soveral, S.J.". Manresa. Retrieved 2 November 2016. 1 2 "Blessed André de Soveral and Domingo Carvalho". Santi e Beati. Retrieved 2 November 2016. 1 2 "Blessed Catholic Martyrs of Brazil". Santi e Beati. Retrieved 2 November 2016.